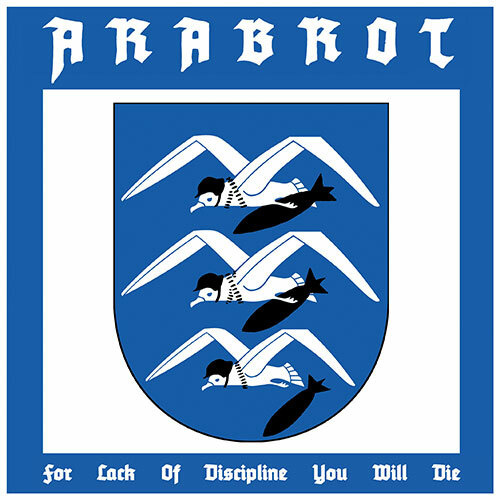 Norwegian Grammy winners, noise rock masters Årabrot present a new 7", "For Lack of Discipline You Will Die". On the A-side track "Song of Calumny" we find Årabrot main man Kjetil Nernes even further down in the black hole we call humanity. The song is a bitter and sarcastic thunderous speech about the uncertainty that makes man evil. This groovy monster hit is also featuring noise maestro Lasse Marhaug. "Song of Calumny" was recorded in the same sessions as the upcoming album "The Gospel", partly in Steve Albini's Electrical Audio studio, Chicago, and finished in Nernes' and Karin Park's home – an old church in Dalarna, Sweden, where they also recorded the B-side tracks. The B-side includes a narrated version of previously released "The Isis Pool" featuring spoken word by Nernes and a layer of drones and moods by Karin Park, who produced the track. (Park is also a regular in the present Årabrot line-up.) The record concludes with an exclusive cover of "Duh, The Big City" by Hammerhead, here named "DUH!" The artwork is, as always, provided by Johannes Høie. This time it is an alternation of the coat of arms to the city of Haugesund, the origin of Årabrot. Black vinyl in full colour sleeve with sticker.